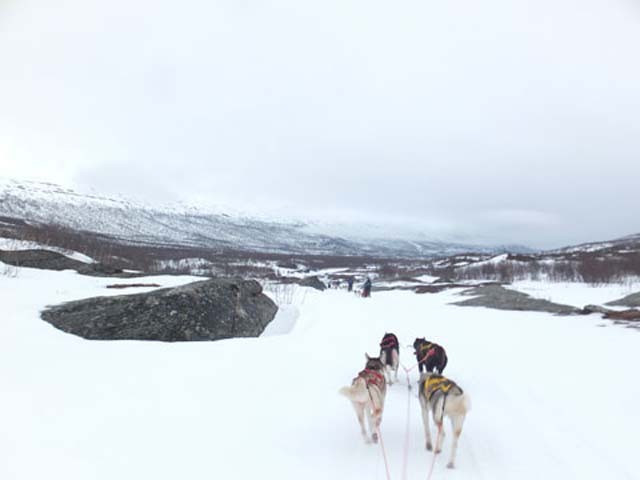 Bob from the Nature Travels team joined a Dog Sledding and Winter Camping on the King’s Trail tour in winter 2016. I’ve been lucky enough to have done quite a lot of dog sledding, including on the King’s Trail before for our Husky Mountain Expedition in Lapland as well as for a number of our other dogsled tours, but this was the first time I’d travelled in the later part of the winter season, and I was really looking forward to the combination of long daylight hours and a spring feeling in the air. I normally sleep soundly on the night train north, but my excitement to be back dog sledding again and the anticipation of getting out into the mountains made for a restless night as the train from Arlanda airport clickety-clacked its way steadily north through the night to Kiruna and the snow-free forests of Stockholm gradually gave way to a covering of white. 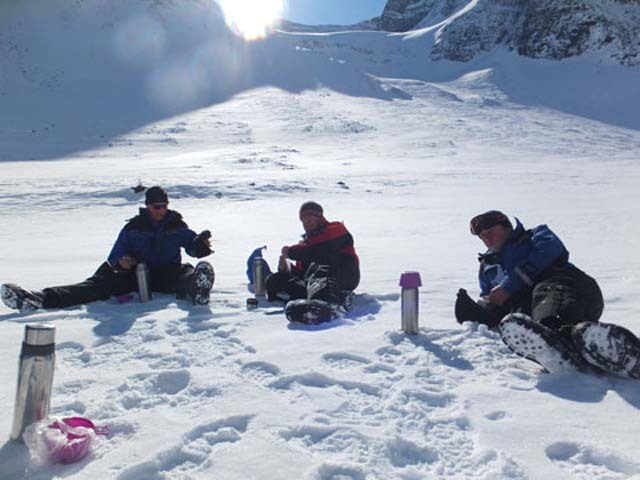 Every winter is different, and any winter activity in a mountain area is subject to variations to the standard itinerary – a winter camping tour doubly so. In this case, in complete contrast to the winter before, when an exceptional amount of snow had remained in the mountains late into the season (our first guests hiking the King’s Trail in mid-June had needed to do part of their hiking tour on snowshoes because there was still so much snow! ), this winter the mountain areas had received less snowfall than usual. Huskies love to pull, but they also know how to take it easy. Photo: Nature Travels. While conditions down in the lowland areas were still very good, just the week before we had arrived, a very unusual mild weather system had parked itself over the Abisko/Nikkaluokta area and refused to move, causing a rapid melt much earlier than expected. 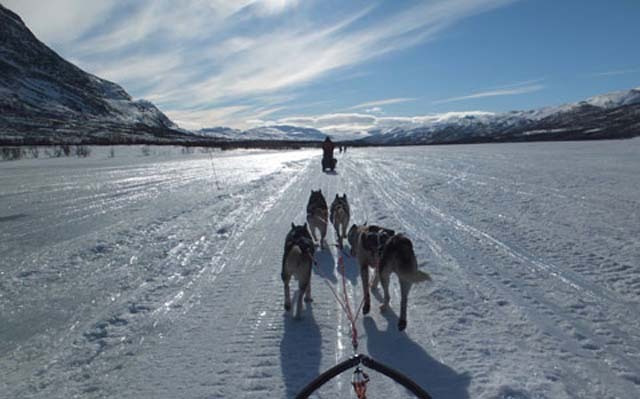 As with any dogsled trip, the dogs are what make it magical. Photo: Nature Travels. There were even reports that one day it had been +11 degrees with torrential rain(! ), which was virually unheard of. There was no problem with snow conditions higher in the mountains, which were still excellent, but the stubborn mild front had significantly depleted snow cover on the lower altitude parts of the mountain route. 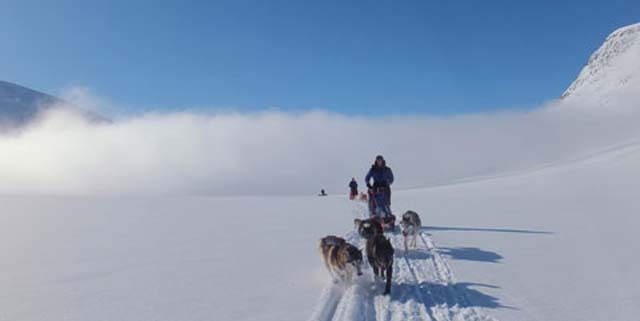 Mountain dog sledding adds an extra dimension to the mushing experience. Photo: Nature Travels. What this meant for us was that, while conditions should be generally fine for sledding, winter camping was going to be difficult. 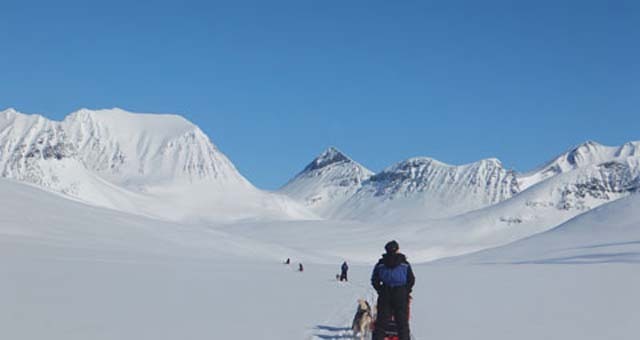 Deep snow is required to be able to pitch and shelter the tents successfully (and with the ground still frozen, anchoring the tents directly into the ground would also not be an option), and the recent mild temperatures were also likely to mean that the tents and equipment could easily become heavy and wet. So the decision was taken that it would be much better to have a successful, enjoyable cabin tour than a difficult, uncomfortable camping tour, and the itinerary was amended to be more similar to the cabin version of the tour, the Husky Mountain Expedition in Lapland. There’s always time for a husky hug. Photo: Nature Travels. As it turned out, though there was no way to know this in advance given recent conditions and the latest reports from guides returning from other mountain tours, doing our tour as a camping tour would have been possible – with the exception of the areas around Nikkaluokta and Vistas, snow conditions were still very good and we were blessed with stunning weather the whole trip. After a comfortable night in the cabins at the kennels, it was time to begin our adventure. It always takes a good while to get organised on the first day – there’s equipment to be checked and packed, and we would be loading the dogs into trailers for the transport up to Abisko Mountain Station to the north of Kiruna, from where we would be starting the tour directly onto the King’s Trail (depending on conditions, tours will normally either begin from here, or at Nikkaluokta to sled in the opposite direction, or from the kennels to spend the first days sledding up towards Abisko before heading into the mountains). We started from Abisko just after lunch, bound for the first cabin on the trail at Abiskojaure. We harnessed our teams, meeting our dogs that would be our means of locomotion and also our friends and companions for the coming week. Over the next few days, we would learn to know and love them all, their very different personalities and little idiosyncracies. 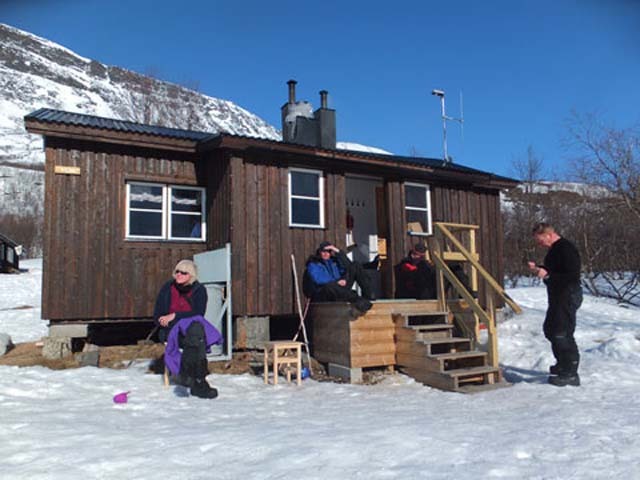 The cabins at Abiskojaure. Photo: Nature Travels. 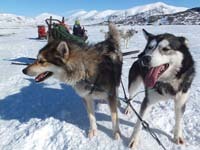 There’s no doubt about it, huskies love to pull, and their excitement and noisy anticipation as we made ready to set off was infectious. Icy trails at times this year due to an unusual warm period. Photo: Nature Travels. This makes for a very good introduction to the week’s sledding. The distance is relatively short and it’s an easy and untechnical section, bringing you immediately into a stunning mountain landscape but giving you the opportunity to gain your confidence before the more challenging terrain to follow. The last time I’d been here, the cloud had been low and visibility limited, so I was delighted this time to get beautiful wide views of the surrounding mountains as we glided along towards Abiskojaure. 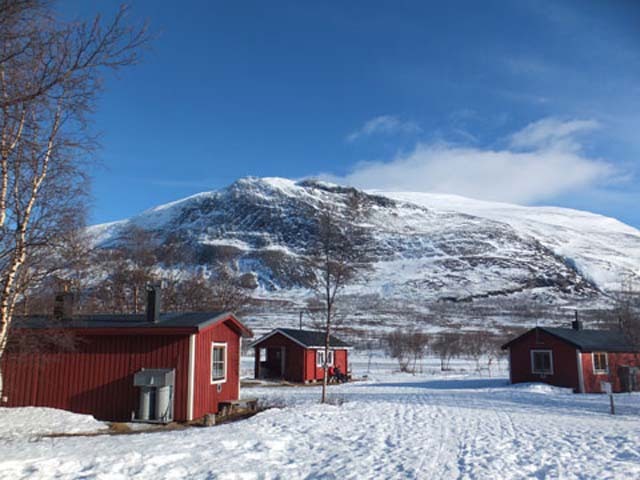 The cabins at Abiskojaure are set in a beautiful spot in the valley. 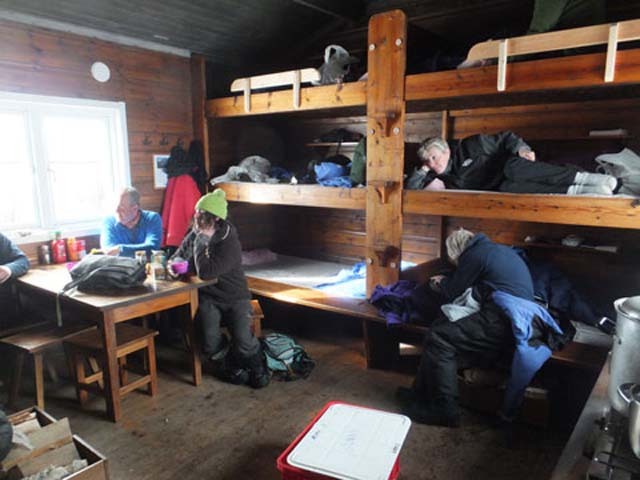 Normally on the Winter Camping tour, the expectation would be to have one or maybe two nights at locations with sauna facilities, but on this tour it turned out that we would be having sauna every night! I’d normally expect to return from a week in the outdoors a little grubby and perhaps not smelling at my best, but by the end of the this week I’d feel cleaner than I’d every felt in my life! If you’re British, the thought of getting naked in front of strangers probably fills you with horror. It certainly did for me when I first went to Sweden many years ago. But don’t let your natural shyness get in the way of a great part of the experience – “When in Rome” (or Sweden…). And once you’ve taken the plunge, you’ll never look back. No-one except you will care (or even notice) what you look like without your clothes on, and the sauna is a great place to meet and talk to locals, many of whom ski the King’s Trail during wintertime. There’s also nothing to beat the feeling of freedom to be had by running outside for a roll in the snow – or even a naked snowball fight, as some German guests were to demonstrate later in the trip! There are normally fixed times for men and women and a “mixed” time at the end of the evening. And if you really can’t bear bearing all, you’re welcome to go in with your swimming costume. The saunas also provide an opportunity to wash – the fire heats a tank of water which you can then mix with cold to sluice yourself down for the best shower feeling ever! 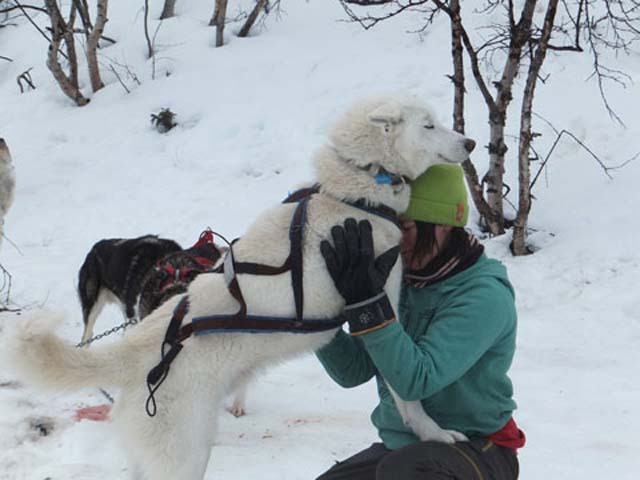 We awoke to another beautiful bright, blue day, completed the morning ritual of breakfast (dogs first, people second) and husky hugging, harnessed our teams and took to the trail. It’s going to be a lovely day! Photo: Nature Travels. 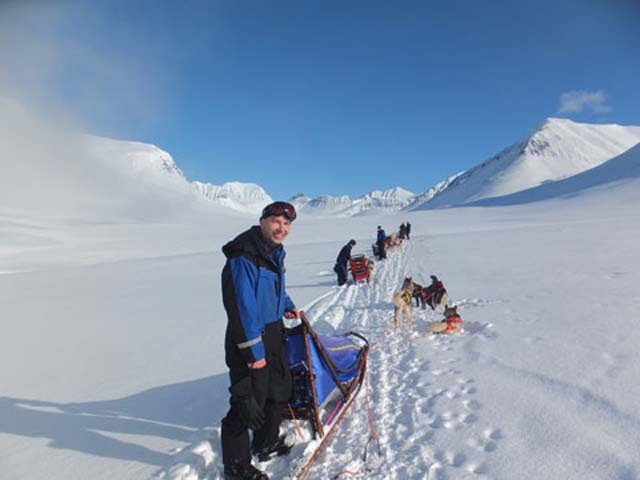 The first part of this section takes you quickly into a climb which reminds you that dog sledding is not all about standing on the sled letting the dogs do the work. They need your help – especially when going uphill – and there was a good deal of pushing, scooting and sweating to do on the first part of this section. And if you don’t do your bit, they will notice, go on strike, look over their shoulders with an accusing expression, and (quite rightly so) refuse to move until you put some effort in. The mountain scenery gets more dramatic as you go along. Photo: Nature Travels. That said, we had it easy. Trail conditions throughout the trip were to be excellent – hard-packed and fast – so the climbing sections were significantly less strenuous than I’d experienced the last time I’d sledded this way. Dogsled adventurers! Photo: Nature Travels. One consequence of such trail good conditions was that we were covering ground quickly. 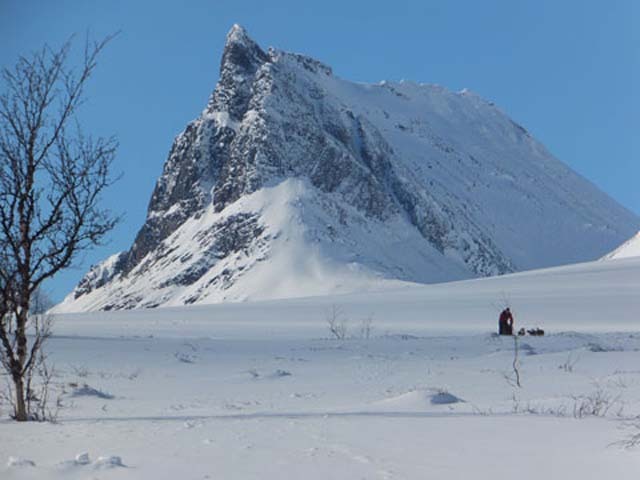 The time taken to cover a particular distance when sledding can vary enormously – breaking a new trail through deep, fresh snow in a strong headwind is very different from sliding effortlessly over hard snow with no wind beneath a clear blue sky! – and so on this trip we tended to reach each day’s destination relatively early. But there’s always plenty to do at the cabins – the dogs need to be harnessed and fed, wood needs to be chopped, water fetched, and dinner prepared. What was particular nice on this day is that the cabins at Alesjaure are beautifully-located on a small hill with incredible views down the valley, and to make the most of the late afternoon sunshine, once we’d got everything organised, we went for a lovely stroll along the frozen lake to take in the views. This area is home to the extremely rare Arctic Fox, though they are seldom seen. One of our group, James, had caught sight of a red fox just after we arrived, but was then also rewarded with a privileged view of an Arctic Fox, much less commonly seen, scurrying along the valley floor. As we walked along the lake, we came across the remains of a Ptarmigan which had been its prey. It was getting towards the later part of the Northern Lights season, as the skies were still partially light well into the late evening, but the Aurora is still visible at this time of year and good displays can still be seen, so we spent part of the evening keeping a watch on the skies in the hope of a show. Sure enough, while not the strongest display I’ve been lucky enough to witness, we were treated to some lovely shifting curtains of green showing themselves through the gaps in the gathering cloud, before it was time to turn in. Through the evening, the wind had been picking up, and I lay cosy in my sleeping bag listening to it whipping and whistling around the corners of the cabin. I was wondering if the “Bob jinx” was once more rearing its head. While it’s not uncommon for stormy conditions to necessitate being cabin-bound for a day on a mountain tour, it’s not particularly common either, but on both my previous week-long dogsled tours in the Swedish mountains we’d been blown in for a day (although it’s a shame when that happens to be missing out on a day’s sledding, it’s also by no means necessarily all bad – experiencing a raging storm in the mountains from the comfort of a cosy cabin is quite an experience in itself!). But when we awoke, the wind had dropped to just a whisper again and it looked like it would be another fine day ahead – phew! the Bob jinx was lifted! I was looking forward to this. Today we would be going over the highest point on the King’s Trail, the Tjäkta pass, and I was keeping my fingers crossed for clear weather, as the view is amazing. Climbing up towards the pass. Photo: Nature Travels. We started beneath overcast skies, but as we climbed towards Tjäkta, the cloud thinned and there were glimpses of blue above. This is a hard climb, though once again the trail conditions were in our favour, so it was far less of a struggle than I had remembered from my previous trip. Stunning views as we descend into the valley. Photo: Nature Travels. 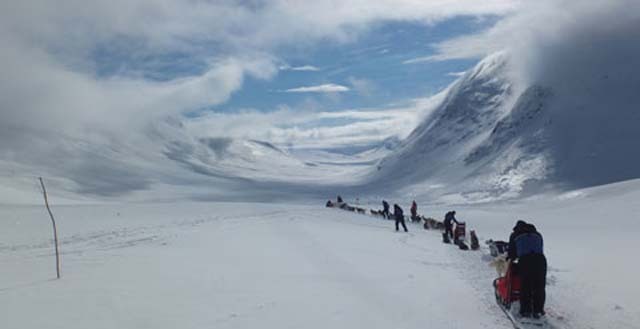 Coming over the highest point of the pass is followed immediately by a dramatic and exhilarating descent into the Tjäkta valley below. It looks incredible, but from a sledding point of view it’s very tricky and potentially hazardous for the dogs. 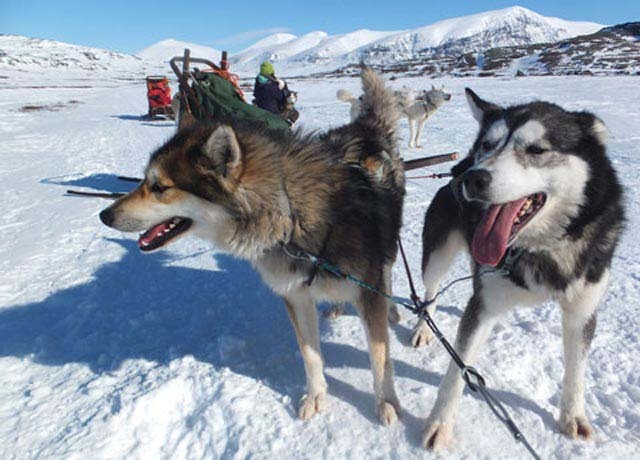 It’s essential to take things very slowly and brake with all your strength – an out-of-control sled can easily overtake and injure the team, while falling off and letting go of your sled at this point can be equally problematic (huskies love to pull, and they will continue pulling regardless of whether there’s anyone on the sled behind – losing a team in the mountains is a scenario to be avoided at all costs). So we approached this part with necessary caution. Jenny, our main guide, was ahead as always, while Julia, who was serving as an extra guide on this occasion, changed from her normal rear position to also sled in front, in order to maximise the chances of catching a sled just in case one should escape. As it was, our descent went off entirely without incident – everyone in the group did an excellent job of controlling their sleds and teams, not easy on this particularly demanding section, and as the valley flattened out, we took a breather to survey the beauty of the surrounding landscape, look back towards the pass and congratulate ourselves on how much our mushing skills and confidence had improved in the last few days. Today’s goal was the cabins at Sälka, where a well-earned sauna (this time featuring the naked snowball fight mentioned earlier) completed the day. From here we needed to make a decision about where to go next. A contingency day in case of bad weather is always allowed for on the mountain tours, which will then normally be used as a day tour from fixed base – day tours are great, allowing for the chance to run fast and light with lighter sleds and giving a day free from the routine of packing/unpacking. Often the day tour would be from this point the following day, before continuing on towards Nikkaluokta and the end point. Cabin life. Photo: Nature Travels. On this occasion, reports from previous guides had indicated that the standard route down the valley and out past Kebnekaise might be difficult due to the unusual lack of snow, so Jenny decided instead that we would be turning inwards to head “up and over”, past Nallo and down the other side to Vistas, where latest information indicated that conditions would be better for continuing to Nikkaluokta. I was excited about this, as from now on I would be in new territory, not having had the opportunity to sled that way before. Some days in the outdoors are just magical, and this was to be one of them. We left Sälka and began the climb up towards Nallo. It was cloudy, and I wondered if we’d see much on the way – the section up to Nallo is very scenic and so I was keeping my fingers crossed for a break in the clouds. Sledding up through the clouds! Photo: Nature Travels. As we got higher, we came up through the cloud and into a breathtaking group of mountains that looked almost more like the Alps than Sweden. I can hear my dear, departed Grandma saying “Stand up straight!” Photo: Nature Travels. The effect was even more beautiful because of that wonderful floating-on-air sensation afforded by being able to look down on a layer of cloud and feel like you’re on top of the world. 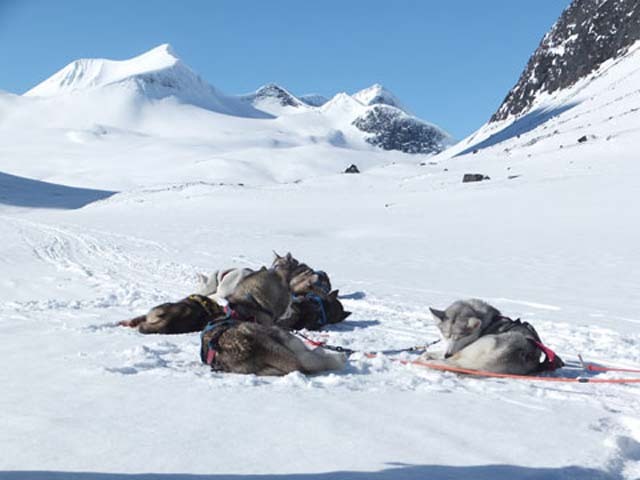 Is this the most beautiful place to dogsled in the world? It certainly felt it today. Photo: Nature Travels. Wow – what a fantastic job I have to give me the opportunity to be here and call it work! Starting our descent. Photo: Nature Travels. Passing Nallo, we could see the lower valley of Vistas below and would shortly be descending below the tree line. From here, it was clear that there was something very unusual about the snow cover this year. The normal unbroken blanket of white that you would expect was pock-marked with large patches of brown where the heathland was already showing through, more typical of early May than early April. Gosh…is snow supposed to be brown? Photo: Nature Travels. 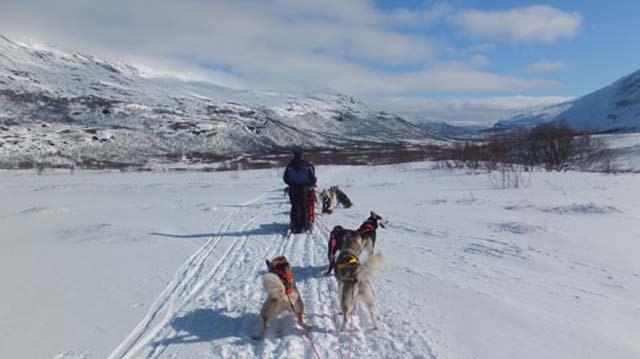 Blimey – it looked like our dog sledding trip would shortly be becoming a “bog sledding” trip! Bog sledding! Where’s the snow gone? Photo: Nature Travels. In the end, it was only the very last section just before the cabins that needed particular care. One problem with lack of snow is of course that the main foot brake on the sled has nothing to work against, or could become suddenly caught in the hard earth and brake the sled sharply, so we were instructed to take it very slowly and to use the plate brake to slow ourselves. We proceeded steadily across the sections of heather, and although these were what would normally be called pretty awful sledding conditions and bumping over the heather was a little alarming at times, actually I found I really enjoyed it! Plus the sun was still blazing from the sky above, which is always a plus. It was nice to be below the trees again, and the forest landscape provided an interesting contrast to the barer landscape of the higher mountains in which we’d been sledding the days before. Safe at the cabins! Photo: Nature Travels. Again, from here we had two options. If the trail to Nikkaluokta was unusable, we would have to sled the “back way” back towards Alesjaure the next day to overnight there to leave the trail the following day where we entered, at Abisko. Alternatively, if the trail to Nikkaluokta was open, we would take a day tour from here tomorrow and sled to Nikkaluokta the day after. 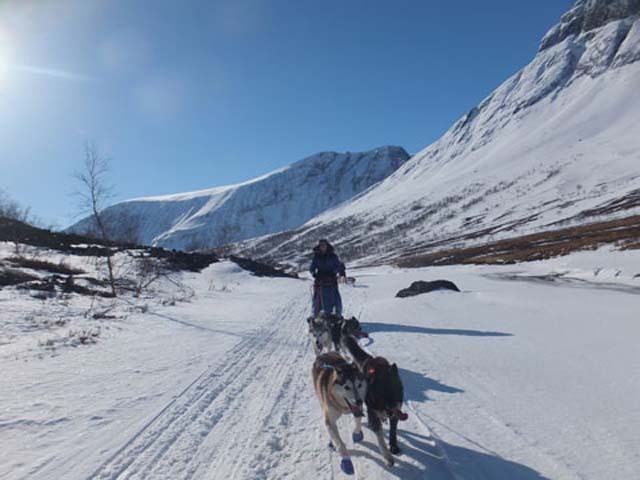 The cabin warden reported that local Sami reindeer herders had been able to make their way up from Nikkaluokta along the river by snowmobile the day before, so then this should still be OK for sledding. So the decision was taken that we would stay here at Vistas for two nights before having pick-up at Nikkaluokta as originally planned. A day tour running fast and light without packing. Photo: Nature Travels. Our plan this day was to head up the valley towards Alesjaure, the way that had been our alternative exit option had the trail to Nikkaluokta been unusable. 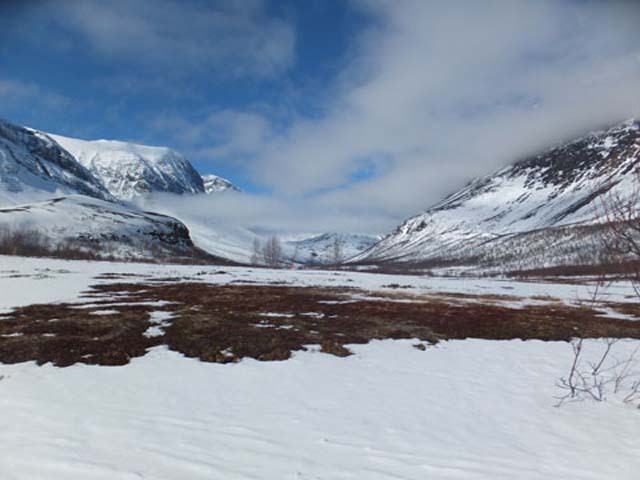 We set off through a beautiful glacial valley landscape, but as we pushed further along, the trail conditions worsened, becoming rockier and with less and less snow cover. It’s not all hard work! Photo: Nature Travels. Had it been essential for us to push through to Alesjaure on this day, the trail would have been sleddable, but as we had the flexibility for a day tour, it was decided to turn here to avoid damage to the sleds (the runners on the bottom of the sleds can be easily destroyed by sharp rocks) and risk to ourselves and the dogs. Instead, we returned to Vistas and turned back up the valley to climb towards Nallo, the direction we’d come the day before. Far from being a second-best option, this turned out to be a lovely trip – an opportunity to revisit this particularly scenic area, once more in great weather, and to appreciate it from the other direction. Having been blessed with amazing weather for our whole week, it was clear this day that things were changing. The sky had a leaden feel, and it was much colder. But although we didn’t have the sun on our side today, it was a great run back to Nikkaluokta – sledding along the river and through the narrow forest tracks was quite technical and a fun contrast to the previous days, and it was exhilarating to whizz past the open areas where the ice was now melting with the (very shallow – don’t worry!) river babbling gently beneath. Heading for home. All good things must come to an end. Photo: Nature Travels. As we crossed the final stretch of lake and the first signs of “civilisation” came into view, I looked back towards the mountains feeling a little wistful. The trailers were waiting for us here at Nikkaluokta, where the road ends (or begins, depending on your point of view) for our return to the kennels and our final night before the journey south. And so our adventure was over. It hadn’t started out quite as we’d expected, but in the end had turned out just fine. We’d had some stunning days of sledding amid spectacular scenery, with the most consistently amazing weather I’ve ever experienced on a mountain tour. Plus I’d be coming home with a suntan.